Let’s face it, not everyone has the time to spend an hour or more a day working out to improve their golf game in order to hit it further and straighter than ever. With one tool, spending 15 minutes a day, you can add distance and consistency to your game. 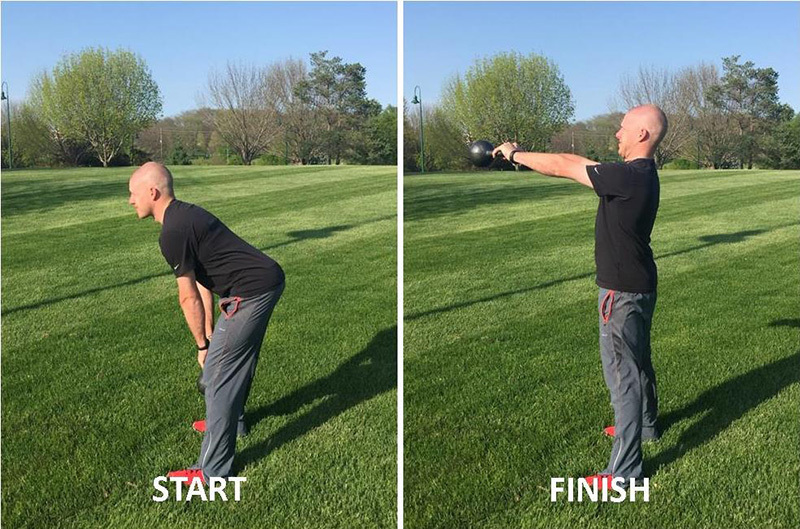 A kettlebell is a valuable piece of equipment that can be used for a wide variety of exercises to counteract the daily grind of your work life. Stability, balance, and explosiveness are the three components these exercises are focusing on in order for you to reach your full potential on the course. It’s important to start with being stable and balanced in your set up. Absence of stability and balance in a golf swing leads to inconsistency in both shot direction and distance. In order to get the most benefit in only a limited amount of time, we need to make sure we get a full body workout in while also hitting on aspects of the golf swing. Below is a set of exercises that will help you strengthen your golf muscles and allow you to continue working on range of motion. A weight between 20-30 lbs would be recommended for someone to get started. 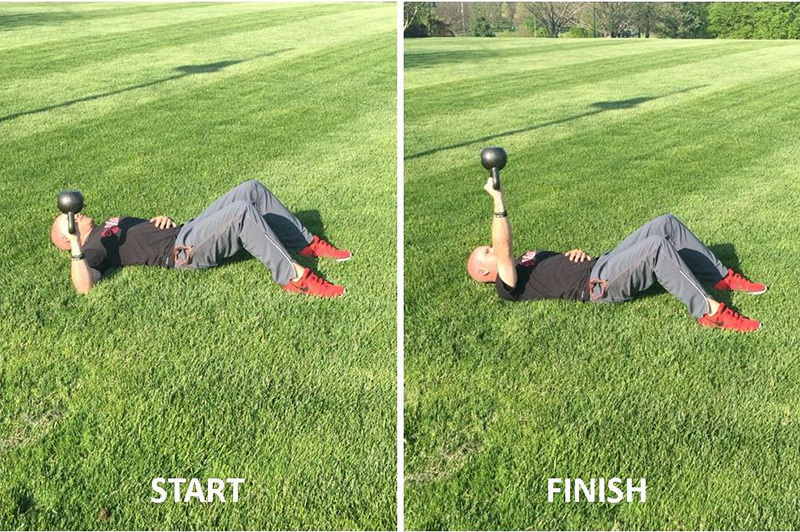 Lying prone on the ground, pick the kettlebell up in one arm with the heavy end vertically in the air, and create a 90* angle with your forearm and the floor. From there, push the kettlebell straight up in the air as high as you can. Challenge yourself to stay as stable as you can in the rest of your body in order to get the most benefit. Isolating your right and left arms will give yourself more balance and control in your golf game as well as understanding what side you need to work on more in order to balance your body out. Keeping the heavy end up in the air through the exercise will also work on your grip strength as well as the little muscles in your forearms that help support your more dominant muscles. 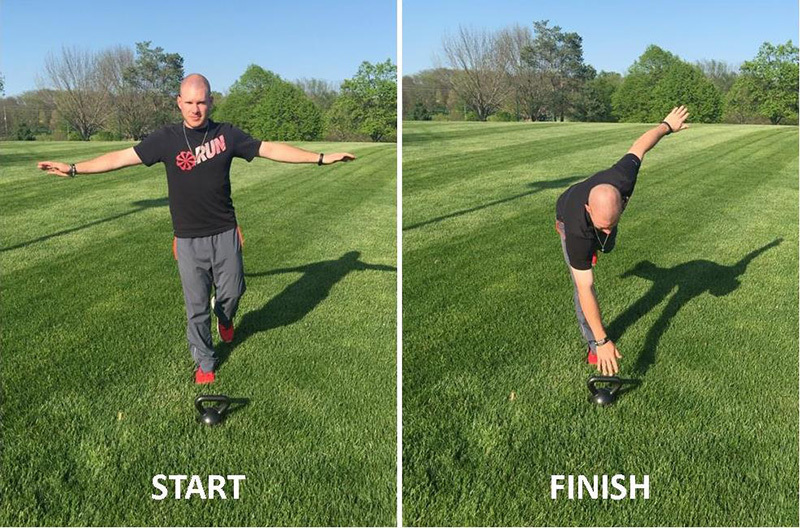 Place the kettlebell on the ground about one foot in front of you. Placing one leg slightly above the ground behind you and placing both arms parallel to the ground, rotate and touch the kettlebell with your right arm, stand back up, and repeat the motion with your left. This motion is going to help your balance and core in your golf swing by improving the strength and conditioning in the same stabilizing muscles around your hips, knees, and ankles that you would use in your golf swing. Stand straight up with feet shoulder width apart and the kettlebell in both hands between your legs. Keeping your head and chest up, push your hips straight back while keeping your legs as straight as you can. You only need to let the kettlebell go down just below your knees. You should feel this in your hamstrings and glutes, the power house of your swing. By developing a stable lower body, you will be able to unwind quickly and on balance in order to deliver the most power to the golf ball you can. This is also a great exercise to counteract the detrimental effects of sitting at a desk all day! 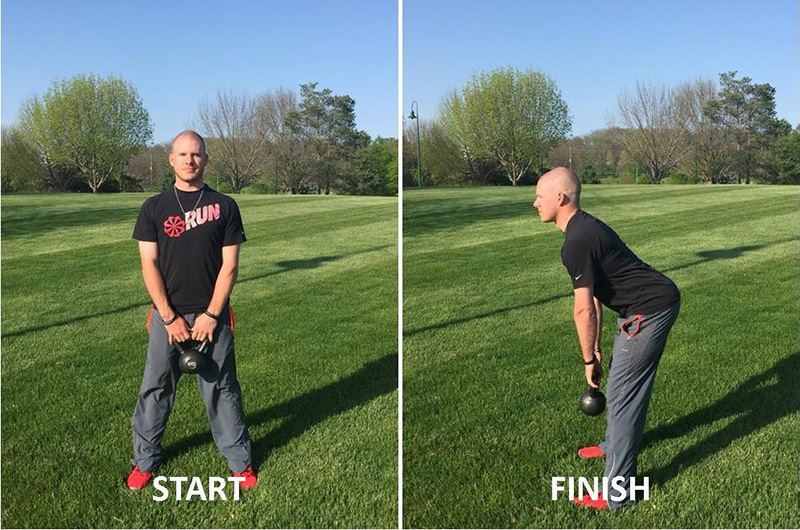 Start with the kettlebell between your knees in both hands. Using the momentum of your hips and arms, swing the bell up to shoulder height and back down to the starting position. Really emphasize the shoulder turn in order to make sure you eliminate any unnecessary movements such as only using your arms. The hip motion will help you find the perfect set up in your golf swing as well as making it stronger and more repeatable. Use a kettlebell heavy enough to make this a difficult but not impossible motion. 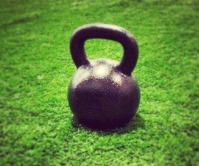 The heavier the kettlebell you use, the more explosive power you will learn to generate! Start with the kettlebell slightly above the ground in between your legs. With your knees bent, explode upwards with the bell pulling it in tight to your chest. From there extend your arm upwards in a shoulder press motion. This is a great shoulder and back exercise! The explosion portion is great for golf, since golf is an explosion sport in its own right. Austin Jarchow is a sports performance trainer in the Kansas City area with an emphasis on helping clients achieve golf performance goals. As the son of a long-time PGA golf professional and a former assistant golf pro himself, Austin is uniquely qualified to bring together the disciplines of golf instruction with sports performance training. He has a degree in Corporate Fitness and carries multiple certifications including Titleist Performance Institute Level 1, NSCA Certified Personal Trainer, and NASM Golf Fitness Specialist, among others. 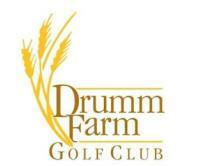 If you haven’t seen Drumm Farm recently, it’s almost as if you haven’t seen Drumm Farm at all. 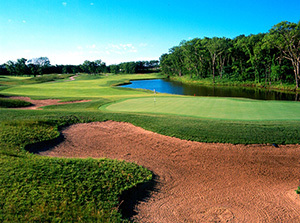 The 7,121-yard course located in the middle of Independence has been a staple of Kansas City golf, renowned for its excellent conditions and charming views. With its acquisition by GreatLife Golf & Fitness, Drumm Farm has retained its top-notch golf courses and has added many new amenities, including a fitness center, new clubhouse and FootGolf. 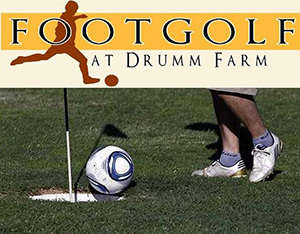 The addition of a FootGolf course is attracting new people to Drumm Farm. FootGolf combines golf with soccer for a fun and challenging new experience and is easily accessible to players of any skill level. Golfers who want to enjoy a traditional round of golf will always have a good time on the well maintained par-72 championship course designed by Dr. Michael Hurdzan or the par 30, 1,674-yard executive course, both of which feature Zoysia grass. 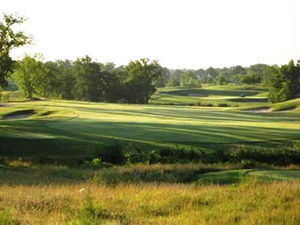 The championship course layout remains the same and will provide a challenge for different kinds of golfers. Long hitters will enjoy taking on the 548-yard par-5 number 7, the longest, most difficult hole on the course with bunkers guarding the fairway and a creek through the middle. Finesse golfers will have their hands full coming down the stretch on the back nine. It’s also an unusually scenic course for being in the middle of town. Among the changes brought by GreatLife is the addition of the fitness center, which opened in February. The full service facility offers state-of-the-art equipment with 24-hour access included in all memberships. Combining fitness with golf is part of GreatLife’s philosophy, and they do it at an affordable price. Family memberships include access for any family under the age of 25, even for kids who have gone off to college. Most GreatLife memberships at Drumm Farm include fitness, golf, and FootGolf while some membership plans also include playing privileges at other GreatLife facilities, including Liberty Hills, Staley Farms, Leavenworth, River Oaks, and Canyon Farms. With many renovations to the facilities have also come some staffing changes. Alex Pisano is the new teaching professional for the Chuck Evans Golf Academy, while Megan Stutler joins Drumm Farm as a personal trainer in the fitness center. One of the things that hasn’t changed at Drumm Farm is the membership. There are a lot of positive changes at Drumm Farm, and McGraw has advice for people who may want to see for themselves. “I would probably tell them it’s very economical,” he said. “The course is always kept up very well, but still the championship course is very challenging. It’s a very friendly place. It’s well worthwhile to come out and enjoy the day. It’s a very friendly place. Some terrific advice an experienced player once offered was to simply let the club do the work, and that advice is never truer than for irons. This month’s equipment feature focuses on the clubs that do the most work tee to green. You’ve got more of them than any other kind of club, so, let’s grab the right irons and put them to work. 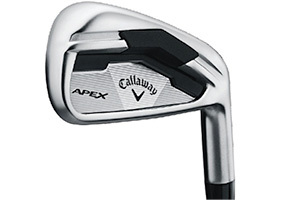 Callaway’s newly-revived Apex irons are designed to provide high performance, a consistent spin and pinpoint control. Tungsten weights in the sole provide a low center of gravity and boost launch angles. 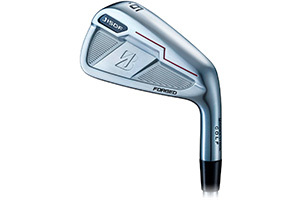 A forged carbon steel body allows forgiveness while a thinner face increases distance. XP95 steel shafts or optional UST Recoil graphite shafts improve club feel. Apex irons are built to be your workhorse clubs. 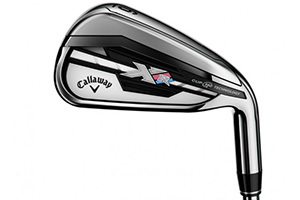 Slower golfers who want to take a step down to even more forgiving irons will do well with Callaway’s XR and XR Pro series which features Cup 360 for improved ball speed across the entire club face. These irons are well designed for the average golfer. 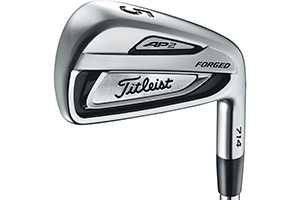 Titleist’s AP2 714 irons are excellent clubs for the creative shot-maker. The multi-material forged irons have height-progression center of gravity with tungsten weighting in the heel and toe to give the club superior balance and stability. The True Temper steel shafts provide excellent feel and top players appreciate the finely-beveled shape which lends well to making a quality shot from a difficult lie. The popular AP1 irons are much more forgiving, whereas the AP2 irons have surrendered a bit of distance to enhance accuracy and control. If you’re a player who enjoys crafting a pinpoint approach, the AP2 will fit your game. 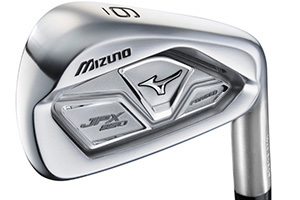 Mizuno JPX850 Forged irons are power clubs. Six years in development, these top-rated clubs regularly place among top clubs rated for distance. With weight pushed to the corners of the club head, players will experience some forgiveness on mishits. The Ultra CNC Milled Pocket on clubs 4 through 7 induce better launch angles, while a thin face provide good ball speed. The new material is 30% stronger than traditional steel irons, making these irons among the strongest forged clubs on the market. Average golfers will enjoy the added distance while these irons can be powerful weapons in the hands of competitive players. TaylorMade’s new RSi series (RSi 1, RSi 2, and RSi Tour) feature Face Slot Technology on clubs 3 through 8; the pair of slots (heel and toe) on the clubface provide flexibility, consistency and improve club speed when striking the ball off center. Missing the center of the club will no longer cost players significant distance or accuracy. Face Slot is further evolution from Speed Pocket Technology introduced last year. 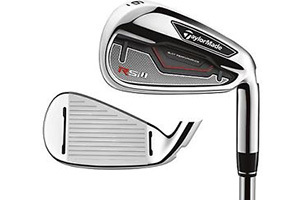 RSi 2 adds tungsten weighting for 3, 4, and 5 irons. Solidly-built with a good feel but surprisingly adaptable to difficult lies, the RSi series irons are built to forgive mishits. Ping’s newest irons have a season in the books, earning top marks. The i25s are designed for distance and accuracy. The steel clubs have tungsten toe weights which help center the striking area. Meanwhile, an ultra-thin face increases ball speed. It’s a well-balanced club which helps a player’s control. 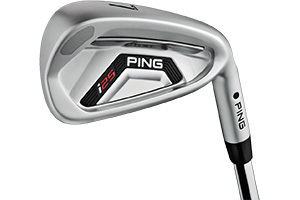 The i25s are especially well-suited to better players who can take advantage of the clubs’ distance, but the average golfer will also appreciate the accuracy and consistency produced by these strong, competition-caliber irons. 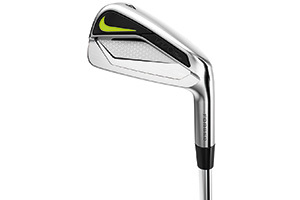 Nike’s Vapor Pro and Speed irons combine style with substance. The Vapor series are designed for superior feel and aimed at difficult shot making ability while the Speed series pushes power and forgiveness. Players can also enjoy all of these features with Vapor Combo clubs. All three irons look sharp and utilize new “Modern Muscle geometry,” a low, deep, face-focused center of gravity which provide strength and high trajectories. The Vapor Pro irons are good for the improving golfer, while the Vapor Speed clubs are best for competitive players. 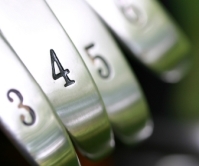 Bridgestone’s J15 series give players excellent feel with improved forgiveness. The J15 DPF (Dual Pocket Forged) irons are aimed at the improving player but may be a better fit for players at the higher end of that spectrum as they reward especially well-struck balls with distance and accuracy but aren’t as helpful when missing the sweet spot. The hollow cavity on the J15 DF (Driving Forged) irons give the experienced player tremendous distance with high trajectories and some of the best accuracy of any competitive irons, making them some of the best irons available for the better player. 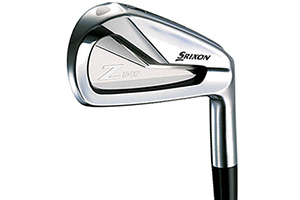 Srixon has released a range of irons for golfers of every stripe. The Z 545 irons give improving golfers a solid performer with a low center of gravity and a strong stroke, but its relative lack of distance makes it a lesser choice for competitive players, who will be better served with the Z 745 or Z 945 models. These higher-end irons provide accurate range and tremendous precision, and are very good choices for creative shot-making. Golfers won’t get a great deal of distance from the Srixons but they’ll be pleased with their placement.